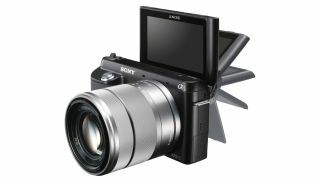 Sony NEX-F5 to feature inbuilt WiFi? Will the NEX F5 feature the same flip-up screen as the recently launched F3? It's barely been a week (in fact's it's been 8 days) since Sony announced its latest compact system camera, but already the rumours about its next release are hotting up. Several reports suggest that the NEX-F5 will be unveiled soon, with rumours hinting that it may be the first interchangeable lens camera from Sony to include integrated WiFi. Samsung was the first manufacturer to produce an interchangeable lens camera with this function, with its recent upgrades to its NX range (NX20, NX210 and NX1000) announced just last month. Along with integrated WiFi, several of the features from the newly announced F3 are thought to be put to use. These include the 180 degree flip up screen, designed for taking self-portraits with ease and the 16 million pixel sensor. Rumours suggest that the F5 will be revealed in the summer, which would be in line with Sony's release schedule from last year. The company announced the NEX-7 and NEX-5N in August 2011. It's shaping up to be a big year for Sony if all the rumours are to be believed. It's also thought that the company's first full-frame DSLT will be revealed, along with new optics for both its A-mount (DSLR/T) and E-mount (NEX) ranges. Stay tuned for more updates as they arrive.